Summary: This walk in the lovely countryside of Wensleydale is ideal for completing in just a half day or a long summer evening. Easily walked within three hours and with no significant climbs at all it is suitable for most abilities. 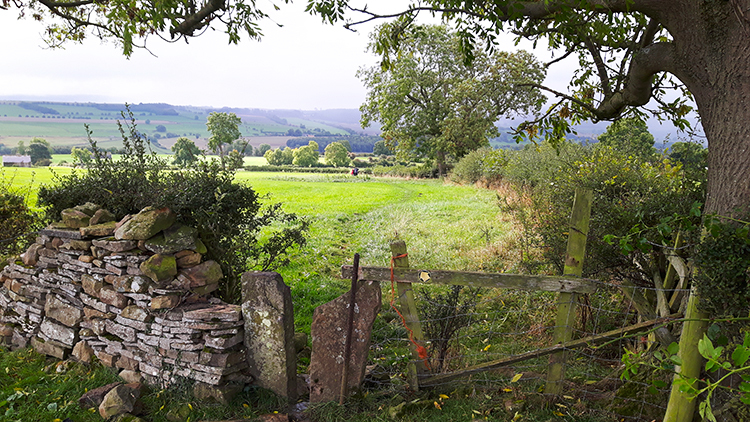 In fact the most difficult part of the walk for my group was crossing some stiles and squeezing through some narrow field gates on the final stretch of walking between the village of Wensley and Leyburn. 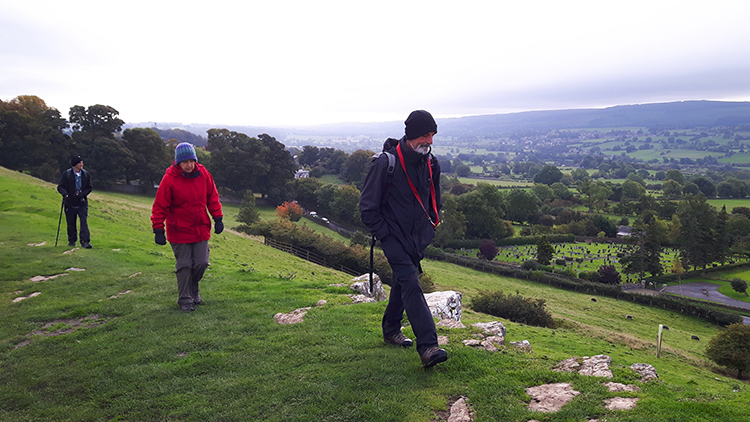 After making the gradual climb from Leyburn to the Shawl and after walking along the limestone ridge the walk drops on an easy and even gradient into Wensleydale. 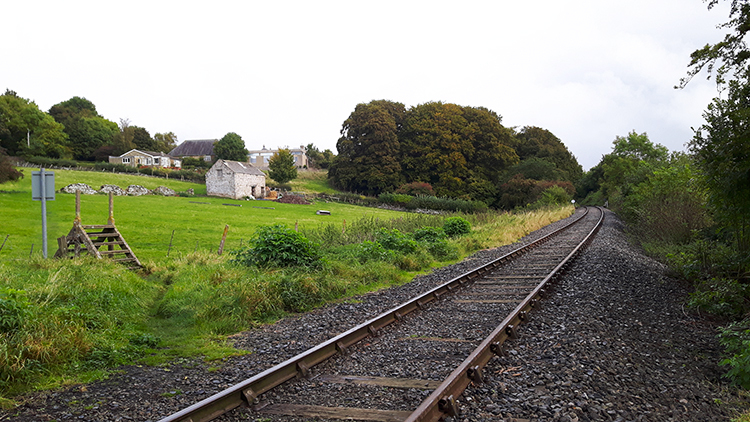 The village of Wensley marks the lowest point of the walk after which a steady ascent is made through fields and across the Wensleydale Rail line which leads back into Leyburn. 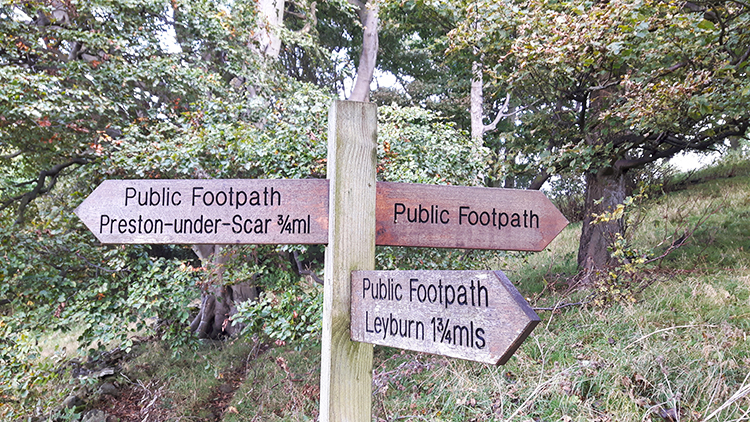 The Walk: Welcome to Leyburn say "No visit to Leyburn is complete without a stroll along Leyburn Shawl escarpment with views of rolling Wensleydale. It stretches for a mile and three quarters". 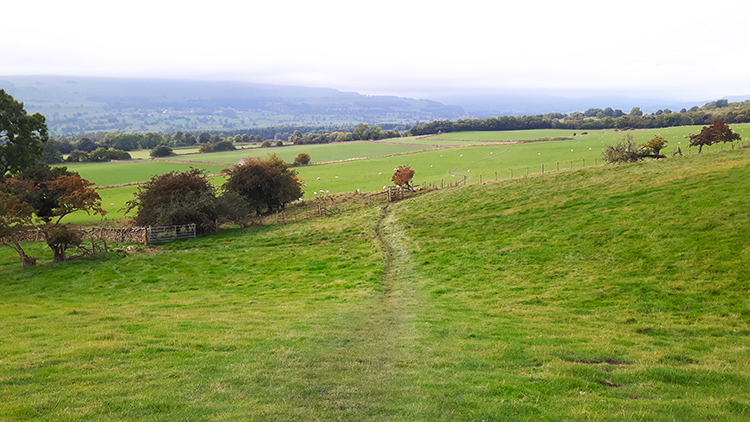 With that enticing invitation how could I not walk along the limestone ridge which overlooks Leyburn and Yorkshire Dales valley of Wensleydale when I next got the chance to do so. 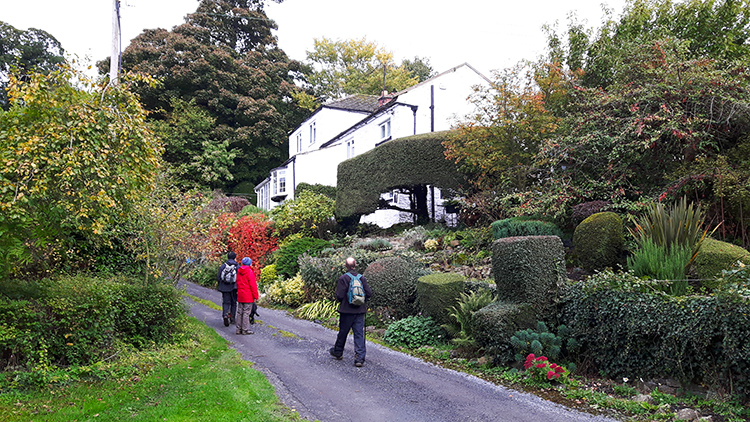 And as I was staying in Reeth with Dave, Steve and Jan for a week in the late Autumn I took the opportunity presented and with it I promised my group that their walk would be one they thoroughly enjoyed. 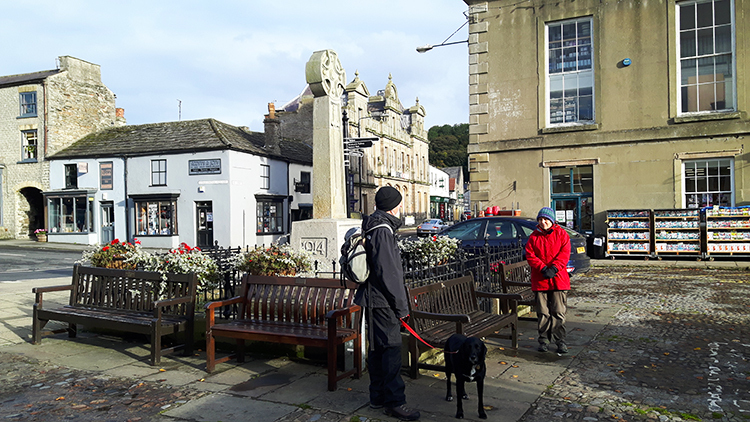 It was October 12th and despite the lack of sunshine as we prepared to set off walking from the town square in Leyburn it was hardly cold. Yes we had coats and hats on but then again Steve, Jan and me were now Sexagenarians and needing to look after ourselves. Dave was not far off joining our club either. After setting off from Leyburn and following a sign pinned on a building with an arrow pointing saying "Way to the Shawl" we followed a couple of streets to reach open ground. We continued on upwards to the limestone escarpment but the climb was hardly noticeable. Leyburn is a high town at 200 metres and above the Wensleydale valley. Leyburn Shawl was to peak at just over 250 metres and that point was a mile and a half away. 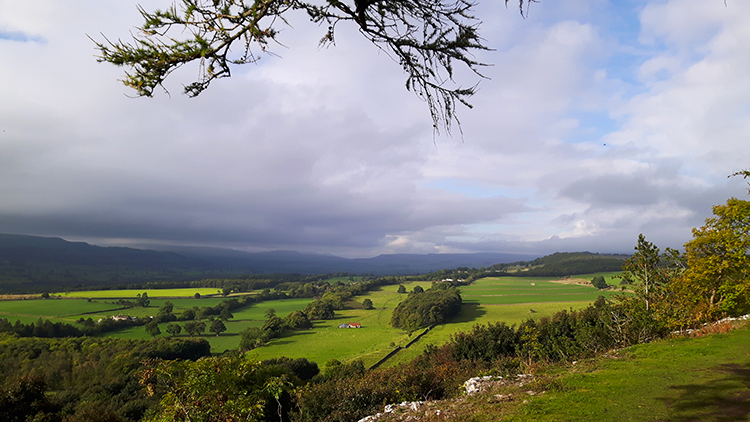 Continuing on our unnoticeable climb to the Shawl and before we reached the cover of trees in Leyburn Shawl Plantation we enjoyed our first panoramic views over the luscious and richly green part of Wensleydale presented before us. There was a mix of blue and grey in the sky. The low October sun was playing at breaking from cloud to brighten us and then dipping back into cloud to dull us at regular intervals. A thicker line of clouds scuttled across the hills of lining the south side of Wensleydale, the cloud line keeping a height of around 520 metres. I knew that because Penhill which is 553 metres high was the only hill touched by the cloud, its top 30 metres permanently shrouded by the cloud cover. 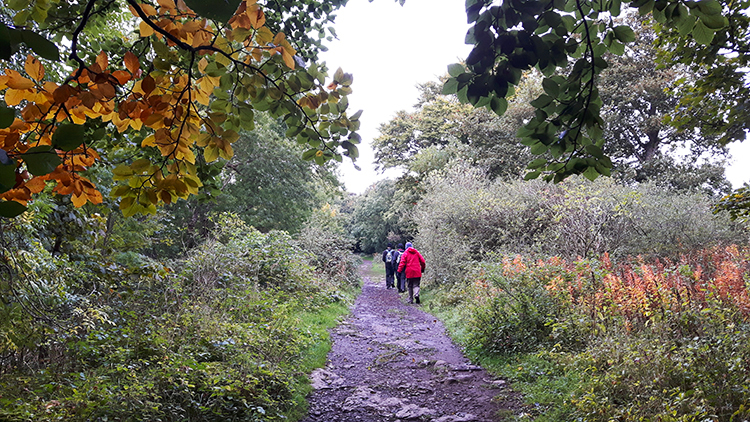 We lost the views to Penhill and the wider valley when we entered the Plantation, instead entertained by Autumn leaf colour. 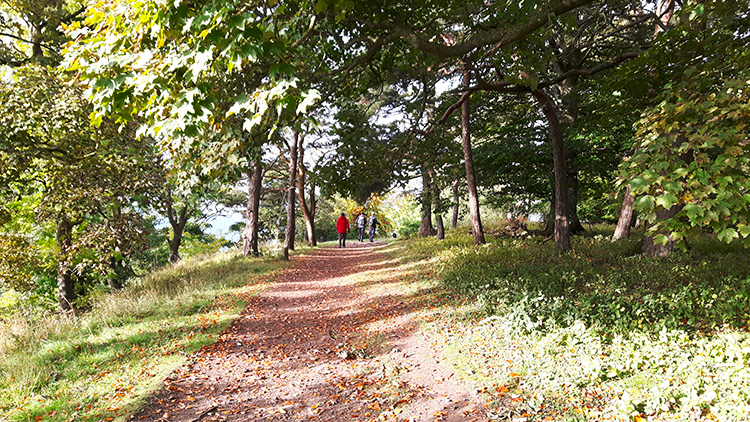 A sign I had read when reaching the Shawl had said "In the Spring of 1841 some young tradesmen of the town decided to begin laying out the Shawl in walks and erecting grottoes and seats for walkers". For 15 years after the locals held annual tea parties on the Shawl. The sign also informed me of its geological forming and of its subsequent naming. For the geology piece it read "Leyburn Shawl is a bold limestone terrace, extending almost unbroken for a distance of two miles, gradually rising until an height of 870 feet above sea level. The limestone at this point is about 60 feet thick, forming a very bold escarpment overlooking the valley". For its name it read "This rocky scar is often mentioned in local history books as the route taken by Mary Queen of Scots whilst making an unsuccessful attempt the escape her imprisonment in Bolton Castle 1586-9. Legend tells us she dropped her shawl during her flight and hence the name of this scar". So there you go, the fact and perhaps the fiction too? ~Anyway, we passed some of the designed grottoes and some seats set along the shawl while walking along the top of the limestone edge. We also passed lots of trees, both deciduous and evergreen. Some were very old. Perhaps Mary Queen of Scots had rested against one or two of them? We didn't continue on to the western end of the shawl which would have led us to Preston-under-Scar, instead dropping down from the limestone top to cross a couple of large pasture fields leading to the Scars which were in fact a finger of plantation with a path alongside which we followed westwards towards Tullis Cote. 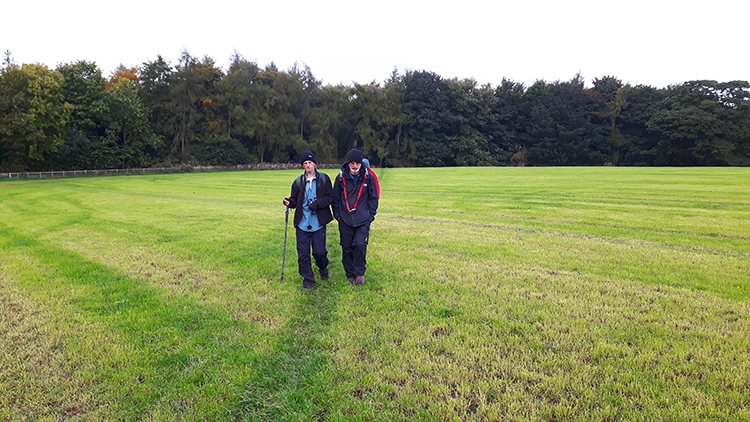 After walking along the thin tree line of the Scars we reached as crossroads of bridleway and footpaths near Tullis Cote. At the crossroads we met traffic in the form of a lady leading two timid horses. She politely asked us to stand still and be quite as she led them past us; which we duly did. 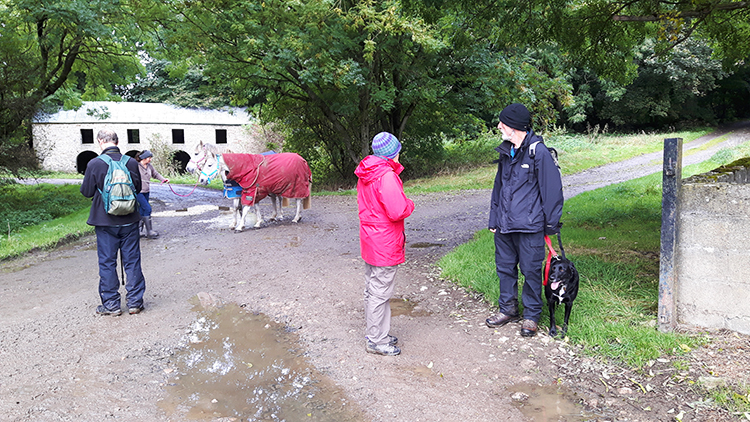 After the horses were shepherded past we continued on from Tullis Cote, which incidentally appears to be a farm and nothing else, by turning left and heading south along a footpath to the site of what the map said was Tip (dis). 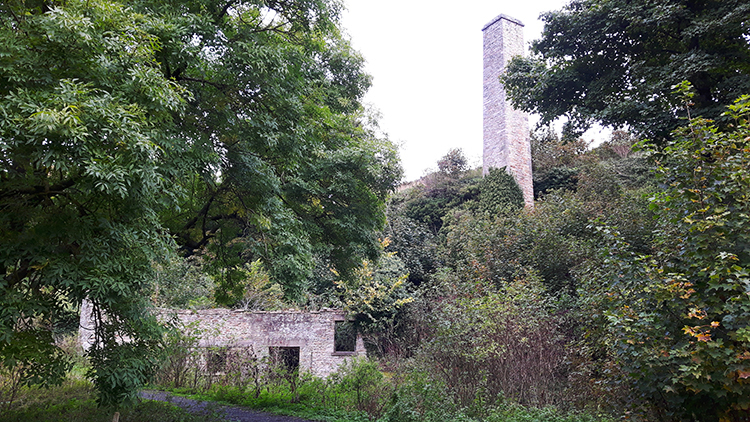 We came across some impressive working ruins on the site of the Tip including a substantial mill chimney. 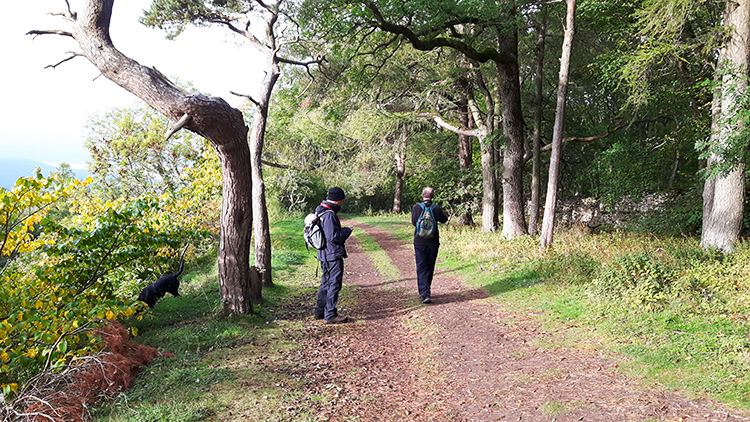 We had happened upon the site of Preston Smelt Mill. 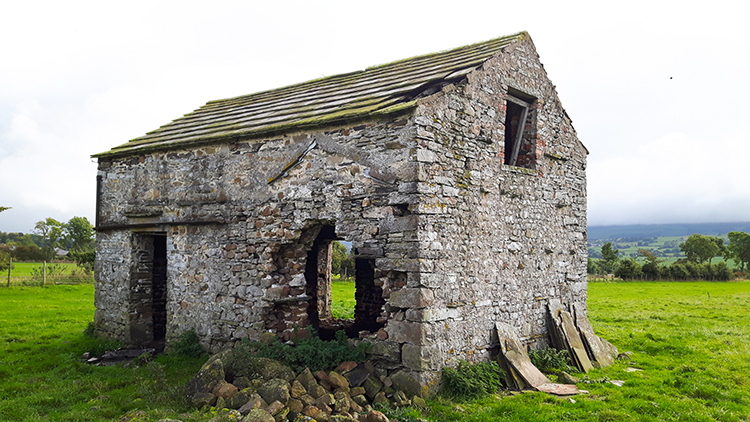 Along with nearby Keld Heads Lead Smelt Mill significant workings were productive here for centuries, first on a small scale and then in increasing activity during the industrial revolution. 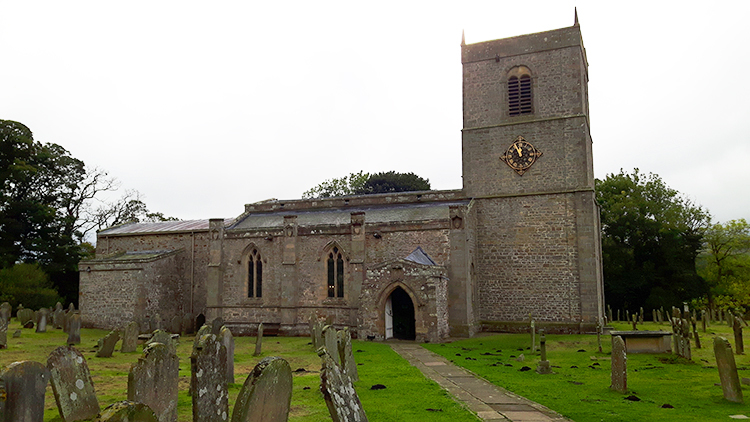 In the 13th century it was a prosperous operation which provided lead for the roof of Jervaulx Abbey. By 1823 the mines were becoming exhausted but a series of long adit levels were driven deep into the hillside beneath the mill which brought back prosperity to the mine. Silver was even refined from the lead ore, if only in small amounts. Now the site is a ghost. I found it an evocative and welcoming ghost with the site of the works now being naturally reclaimed by nature. Immediately on leaving the site of the old lead mine workings we reached a quiet stretch of road which led us towards another relic of the industrial revolution. Only this one had been restored. 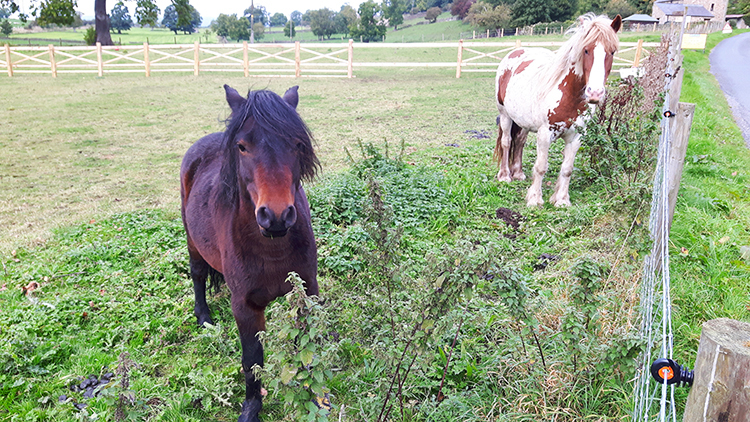 First we passed a field of friendly horses which came to us as we passed their field. We stopped and talked with them for a minute or two which I am sure they appreciated. They gestured so. After the horse chat we came to the railway line of the restored Wensleydale Line. British Rail disowned it. Enthusiasts reopened it. Wensley Railway Station House looked very charming. Nothing left to ruin here. From Wensley Railway Station we crossed a field and then followed a short 100 metre stretch of the Wensley to Redmire Road before leaving the road and walking through woodland leading into Wensley Park which proved to be one massive field. Walking across it was time for a chat as we ambled our way down the field. So let us chat... "Did you know", I said as we walked towards the dip of Wensleydale "that soon we shall arrive in the village of Wensley, bearer of the valley name if not bearer of the river that formed the valleys name". I added "It is in fact the River Ure which flows through this famous Yorkshire Dales valley and did you know some locals affectionately maintain the appellation Uredale. It has not quite caught on nationally though. There is no such thing as Uredale Cheese. And no other major dale in the Yorkshire Dales National Park is named other than that of its native river". The chit and chat about this and that helped us ease down into the village of Wensley. And what a lovely village Wensley is with stone built houses of some beauty. There are the grand buildings of Wensley Hall and Wensley House but the humble central village houses and cottages are every bit as charming. e looked and smiled everywhere we looked to in Wensley. At least the dale of the River Ure could be proud that a lovely village took on the name of the valley. (I still think it a slight to the river though, it is properly Uredale for me). Oh, walk down the main road a little past the church instead of turning if you like. You will reach the River Ure and you may sit beside it for a while. 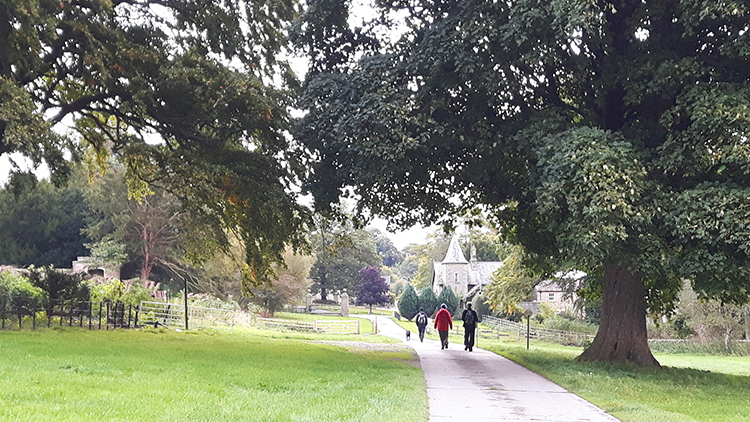 We left Wensley by walking along the road past the village church and by crossing over the trickle of Wensley Brook to follow a lane which took us past the most magnificent garden of a grand whitewashed house. Plants were perfectly managed, hedges and shrubs perfectly pruned. Someone has time on their hands, or money at their disposal, to keep such a fine garden. It really was stunning. After passing the house we came to a filed gate fixed to a concrete upright. The top of the upright read "POW Italian". Below what we could read a date had eroded which would have shown the date it was written. All that remained of it was 15th. (There were Italian POW camps in Yorkshire including one in nearby West Gilling. Perhaps he came from there). 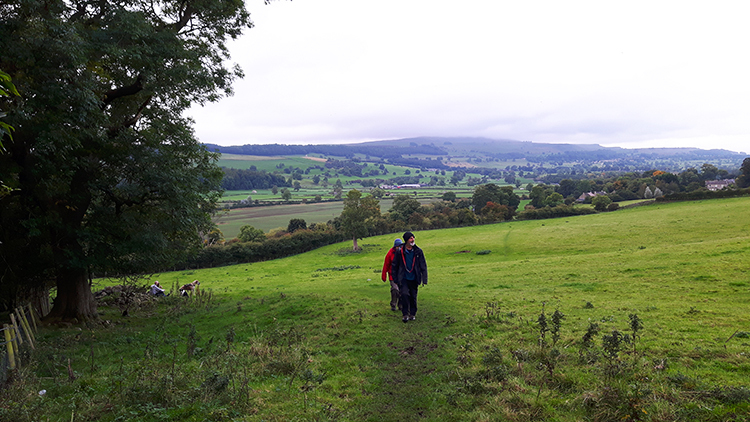 The last phase of the walk from Wensley and back to Leyburn was much the same as from Leyburn along the Shawl, it being a steady ramped climb of not much gradient at all. Still it was to lead us up almost 100 metres which is the difference in altitude between Wensley and Leyburn. We could not really make out the climbing at any time though as we crossed a succession of small paddock fields between the village and the town. Many of the fields held our interest. 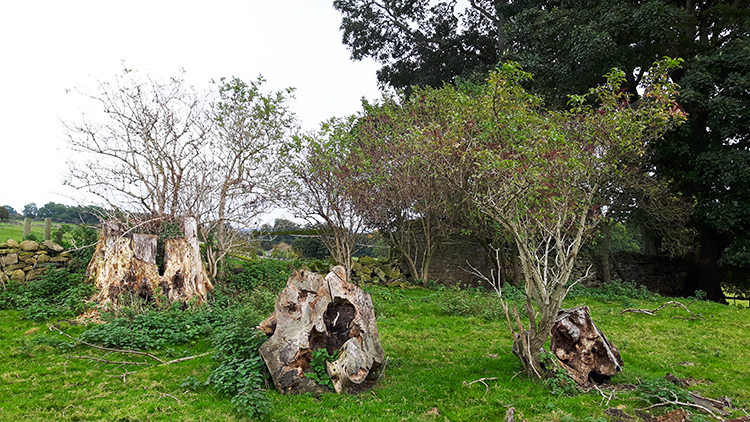 One had a number of trees which seemed to have been felled due to disease and or age. The stumps were all perished white but from each there was vigorous new growth. It was good to see. 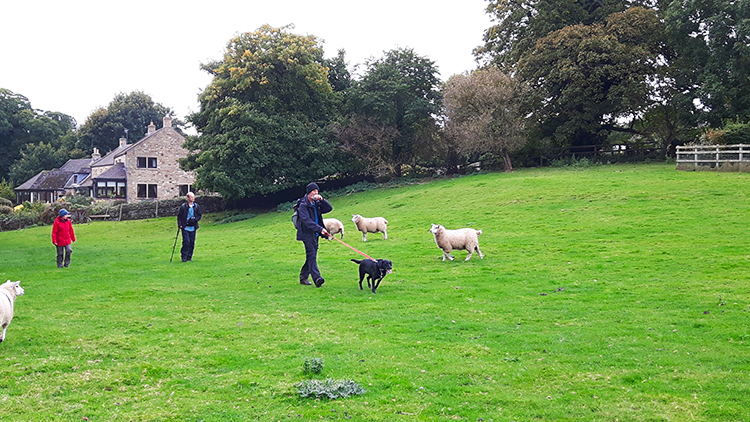 In another bold sheep approached us and Steve's well behaved dog. As if to say "What have you got for us?". Good for them. Passage between the fields had been generally easy with generous gates and good stiles. This changed a little in some of the field boundaries with one or two squeeze gates presenting the odd challenge. Not for us I add but Steve's dog Keira took some lifting over the ones she could not squeeze through. And there were a couple of high stiles with swing gates on top too. Nothing impossible, just a little awkward for the odd 60 year old with a dog! It was quite fun really, an amusing chapter to the walk. After the fun of the fields and the ways of getting in and out of a few things eased again near to the point where we crossed over the Wensleydale Railway line for the second time. Gates returned to take place of stiles which we simply opened and walked through. A couple of concrete ladder stiles took us across the rail line though, the type which reminded me of my childhood where crossing such stiles was a regular occurrence for me when I went to play in the fields and fish in the beck of my home village. 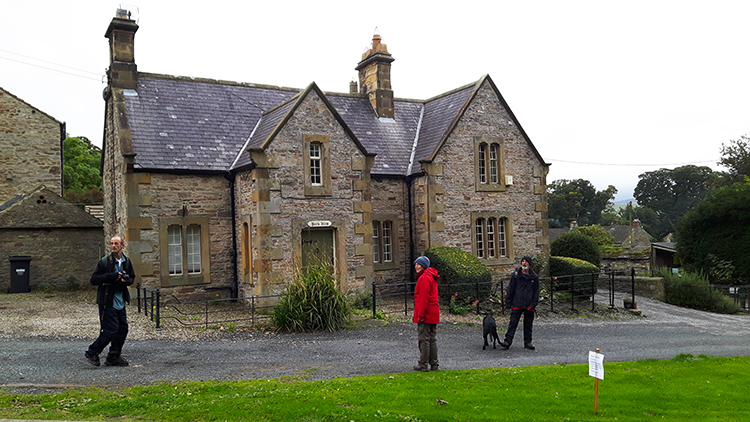 After heeding the code of crossing the railway line and walking over one more field we reached a footpath beside the road which led us back into Leyburn. The walk was done. Such a fine walk too. 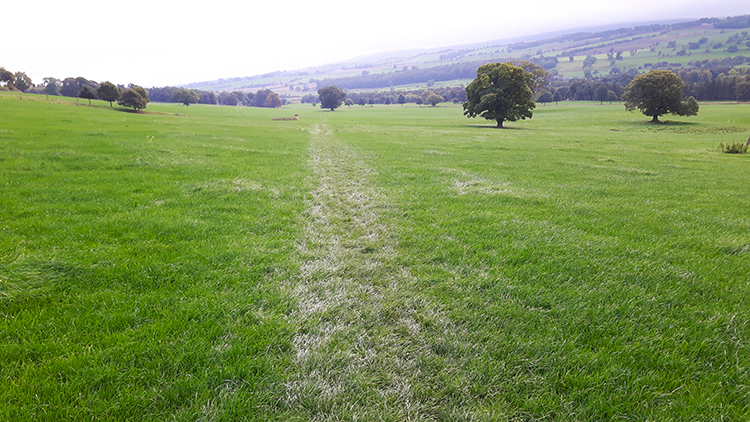 I had always wanted to walk across Leyburn Shawl and indeed many had recommended it to me. They were all right of course, it is a lovely walk. And one with so much interest of which I never appreciated until I had walked it. Not only is there the Shawl but there is the mystique of the old lead smelt mill too. 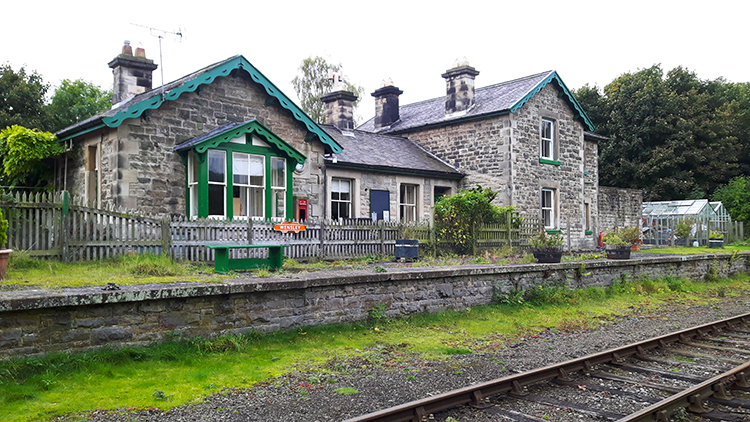 And the Wensleydale Line with its lovely station house. And the gorgeous village of Wensley. And as for the surroundings of the dale throughout, great. Oh, and those sumptuous views which take very little effort to attain. Every box was ticked.